Describe how to use opportunities. Set up a sales process. Add Contact Roles to an opportunity. Set up an Opportunity Team. Every company is unique, but all companies want to find, sell to, and keep customers. Salesforce has the tools you need to grow your pipeline and make more sales. Salesforce features designed to support your sales process include leads, campaigns, products, pricebooks, opportunities, and quotes. In this section, we’ll learn about leads and opportunities. You can use opportunities alone, or you can enhance your opportunities by using them along with leads. View this video for a quick overview of what we’ll discuss in this module. Opportunities are deals in progress. In Salesforce you can create opportunities for existing accounts or by converting a qualified lead. Let’s explore how you can use opportunities to track your deals, better understand who you’re selling to, and focus your team’s efforts. If you’ve worked in sales, you know that deals usually progress from tentative to firm before they’re finalized. As a deal progresses, you grow more confident that you’ll make the sale. In Salesforce, an opportunity moves through a series of stages linked to type of tasks being performed, who’s got the ball, and how likely it is that the sale will be made. You had a meeting with Leung and Alan from Get Cloudy Consulting. They’re interested in your new line of custom sneakers, the Stratus X11. You still have a lot of work to do to close this deal, starting with putting together a package that they’ll want to buy. Your new Stratus X11 opportunity for Leung and Alan might be in the Prospecting stage. As you work the deal through different stages, the likelihood that Leung and Alan will buy from you probably increases. After all, if they were no longer interested in your product, they’d probably let you know or stop asking for information. You can estimate the likelihood of a successful sale based on what stage the deal is at. Each stage is associated with a probability that the deal will be completed successfully. The default probability is set by the administrator. Each stage must be assigned a probability. Probabilities are used when creating forecasts, which are not covered in this course. When determining which stages you will use, consider bringing together some of your sales leaders and key team members to map out your sales process. Determine which of the standard stage names to use and whether to add custom stages for your company. If you customize your stages, make sure that the names are intuitive for your salespeople who will be using them on a daily basis. Make it a semi-annual or annual practice to revisit your sales process and ensure that your stages are still relevant. In Salesforce, you can set up separate sales processes for each type of sale you make. For example, Cloud Kicks may have one sales process to handle standard retail orders for large quantities of shoes, and a separate process for small, custom shoe orders. Setting up each process takes several steps. Create the opportunity stages needed in the sales process. Name the sales process, and select what opportunity stages are included in that particular process. Optionally, create an Opportunity page layout specific to the process. For example, you might include a field called “Custom Embroidery” on the page layout for the sales process for small, custom shoe orders but not on the page layout for standard retail orders. Create a record type for the sales process. Record types link the sales process to the page layout that goes with it. Let’s try setting up a new sales process now. 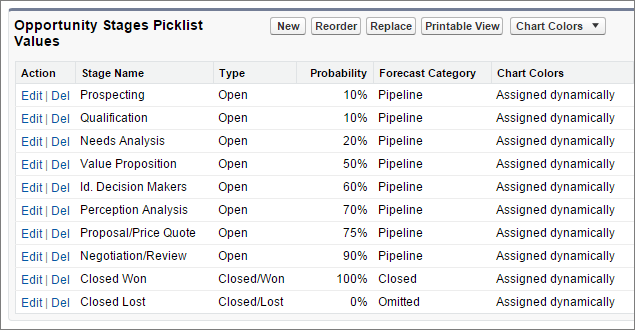 From Setup, click Customize | Opportunities | Fields. Click the Stage field label. Enter a name for the stage. Enter a number to indicate the probability that any given sale in this stage will be successfully completed. For example, if 1 in 5 deals in this stage complete, enter 20 to indicate 20%. You might sell different items using different processes. You must set up at least one sales process in Salesforce, but you can set up additional processes to match how your business actually works. From Setup, click Customize | Opportunities | Sales Processes. To create the first new process for your organization, create a Master process. Give your sales process a unique but descriptive name. For example, Retail Sales. By default, all stages are included in a new process. Remove stages you don’t want to include by clicking the stage name in the Selected Values area, and then clicking the Remove arrow to move the unwanted stage to the Available Values area. For example, if you qualify all leads before converting leads to opportunities, remove Qualification from the selected values. The record type is how you link a particular page layout and sales process to a type of product. Record types determine which types of sales opportunities pass through which sales process. From Setup, click Customize | Opportunities | Record Types. Enter a record type label and a record type name. Select a sales process to apply the record type to. Optionally, add a description of this process. Select which profiles can access the new sales process. Apply the page layout to the Opportunity Layout. On the Opportunities tab, click New. If your organization has more than one record type for opportunities, select the type that best represents this opportunity. Give the opportunity a name. Select the account that the opportunity relates to. Select a close date for the opportunity. Select the stage that the opportunity is currently in. Salesforce adds a probability based on the stage selected. You can change the probability if it isn’t accurate for this opportunity. As you work on the new opportunity, you’ll change the opportunity stage to indicate your progress toward a sale. In the full Salesforce site, you can edit the record to change the opportunity stage. In the Salesforce mobile app, tap Mark This Stage as Complete. Contact Roles for opportunities tell you which contacts you’re dealing with for the opportunity, and how each is related to the opportunity. You can also link contacts from other accounts to the opportunity using contact roles. You recently completed a deal with Get Cloudy Consulting Canada, and you hear from Leung Chan, a decision maker from Get Cloudy Consulting, that she’s planning to talk to her Canadian colleague Lars about your product. For this sale, Lars is an Influencer, and you can track that important information by giving Lars a role in the opportunity, even though he’s a contact on a different account. Take a minute to add Lars as a contact for the Get Cloudy Consulting Canada account. Then continue on to add his Contact Role for the opportunity you just created. In the Contact Roles related list of an opportunity, click New. Click the lookup icon to select a contact or person account. Choose a role. If you don’t select a role or the role is set to None, changes you make to this record aren’t saved. Optionally, select a primary contact for this opportunity. It often takes a team to close a deal. In Salesforce, adding an Opportunity Team helps team members work together and track the opportunity’s progress. Opportunity Teams are a bit like Account Teams. Both allow you to relate particular people at your company to accounts or opportunities. But where Account Team members can be expected to form a long-term relationship with the customer, an Opportunity Team is a temporary group composed of people who can help you close the deal. Being a part of the Opportunity Team gives the team members special visibility into the opportunity, such as updates on Chatter. Although we don’t cover it in this trail, Salesforce offers the Opportunity Splits feature to incentivize team members to complete the deal. 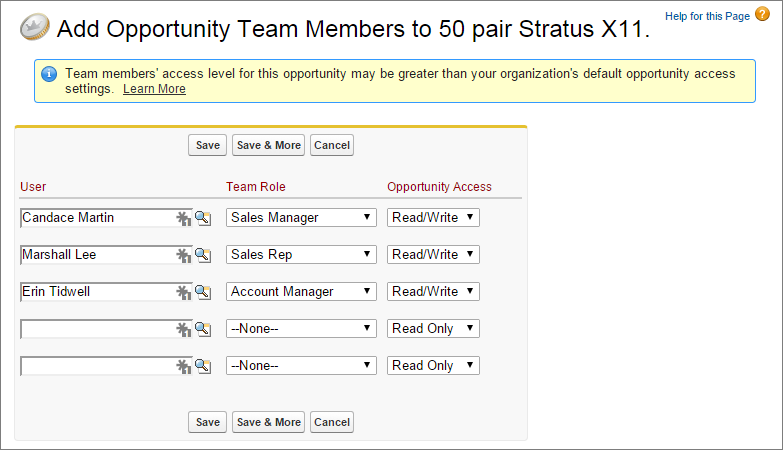 From Setup, enter Opportunity Team Settings in the Quick Find box, then select Opportunity Team Settings. Select Enable Team Selling and click Save. Select which page layouts to include opportunity teams. Optionally, to add the Opportunity Team related list to all opportunities for all users, select Add to users’ customized related lists. If the roles provided don’t match how your company’s sales process works, you can add new roles or change the existing ones. From Setup, click Customize | Opportunities | Opportunity Teams | Fields. Click the Team Role field label. Click New to create a new role. Click Rename to give an existing role a different name. Open the opportunity and navigate to the Opportunity Team related list. In the User column, enter the member’s name. Opportunity team members are granted read access to the associated account automatically. Select the member’s opportunity team role. Select the member’s opportunity access level. The access level can’t be less than your organization’s default opportunity sharing access. Specify values for any custom fields that your administrator has created for opportunity teams. If you often use the same team for opportunities, you can create a default opportunity team and automatically add that team to all new opportunities. See Guidelines for Setting Up and Adding a Default Opportunity Team in the Salesforce Help. Watch a video on how to define your sales process.